The first time I flew with Eli he was 2.5 months old. I was flying on my own across the country from California to Florida, and – to be honest – I was a bit terrified. He was at the tail end of his witching hour and the thought of being stuck in a plane with a screaming baby was nerve-wrecking. Thankfully, he did incredible! Since then, we have flown to Florida four more times, as well as a trip to Colombia and France. I have also flown to Florida on my own four times. 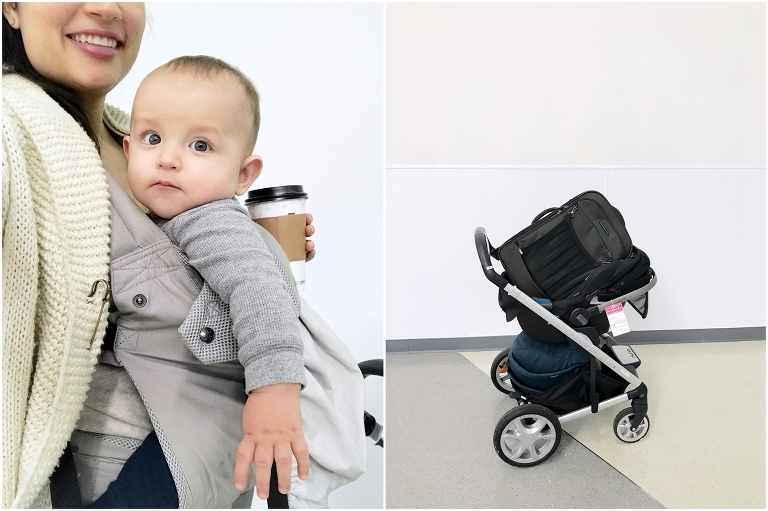 I know every baby is different, but I want to share what I’ve done to make it through a long day of flying on my own with my tiny human in hopes that it might help you too. First of all, baby wearing is life saving. Make sure you travel with a carrier. My favorite is the LILLEbaby. I usually wear Eli the moment we get to the airport. I usually travel with a checked bag, carry on, backpack, stroller and car seat. And there’s only one of me. It’s a lot. In order to make sure I have enough hands I throw my carry on and backpack on the stroller and wear the baby. This way I only have to push the stroller and my checked bag. Once I give the airline my checked bag, I just have to worry about pushing the stroller. When going through security, I always wear him. The only time someone made me take the carrier off was in France. This makes it so much easier when handling everything. A econd, I make sure to always ask for an aisle seat. Before having babies, I loved the window seat, but now I just need easy access to get up and move around. Once in my seat, I make sure I have easy access to his toys and snacks (I usually put them at the top of the backpack underneath the seat in front of me since I’ve read plenty about how those pockets on the back of the seat never get cleaned!). I try my hardest to time his naps and feeding schedule with the flight. It works best if I can breastfeed him right during take off, which helps him take a nap shortly after. I’ve read lots about feeding during take off and landing for ear pain. I still do this whenever possible, even though I’ve never noticed Eli experiencing any ear pain. I always wear my Covergoods cover, which is great because it covers me all around and I usually keep him under the cover once he falls asleep. Once we are up in the air, I try to go change his diaper every 2 hours or so. He doesn’t really need them changed that often, but it just gives us something to do. Its a change of scenery. If he’s fighting his naps (which happens all of the time – this child loves to fight naps! ), I’ll wear him and walk in the back of the plane until he’s out. Now that he’s a bit older, I pack plenty of snacks for him to eat and toys and books. He loves to pretend he’s reading (even though the book is usually upside down). Anything to keep him entertained. When traveling with Matt, things are so much easier. It is nice to have an extra pair of hands to help out, especially when having to use the restroom. 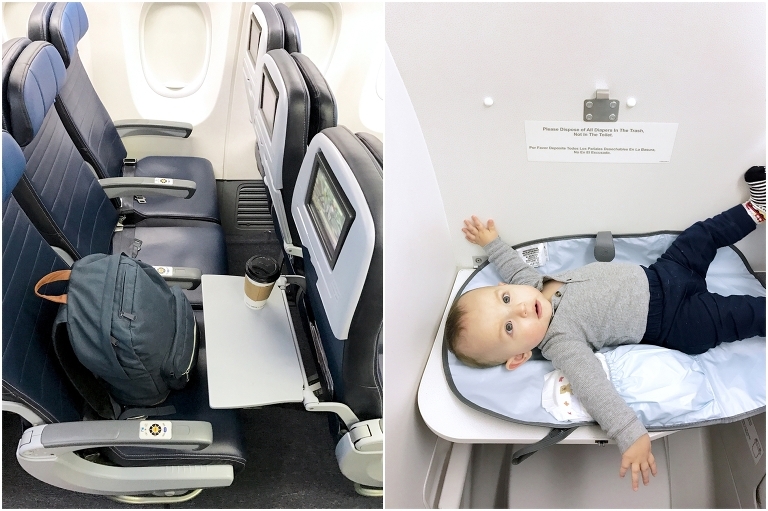 When Eli was smaller, we used to travel with his DockaTot as well (I think a bit about that here). It was incredible for our international flights. He has now transitioned to the bigger DockaTot and we no longer fly with it. Also, just know that crying babies are totally normal. It’s ok if it happens, try to stay calm. Don’t worry about what others might think because babies can feed off our anxiety. And don’t be afraid to ask for help. I have found people to be more than willing to help out a solo traveling mom. The first time I traveled, I did everything on my own. I quickly learned to be okay with letting others do some of the heavy lifting.